Experimental results from the XENON1T dark matter detector limit the effective size of dark matter particles to 4.1X10-47 square centimeters—one-trillionth of one-trillionth of a centimeter squared—the most stringent limit yet determined for dark matter as established by the world's most sensitive detector. Even with shielding from the outside world, contaminants seep into the xenon from the materials used in the detector itself and, among his contributions, Brown is responsible for a sophisticated purification system that continually scrubs the xenon in the detector. As the size of detectors have grown, so has the complexity of the purification system—not only is there more xenon to clean, but it must be kept cleaner so that light and charge may move through the greater volume of the detector. In the current phase, Brown said his team "scaled up, adding more pumps and more purifiers" to the system. Dark matter gives physicist so much to do. Is it light or heavy? Does it interact with matter or itself, or not? Does it exist in all galaxies, and if so, in what distribution. If it does exist in such a distribution, how it happen to form as we imagine it to form? And no one have seen it or measured it, but how many hypotheses it can fuel. Endless. And we crackpots can fantasize too, to our delight. Honestly, if dark matter didn't exist, physicists would have to invent it. Not really. There's plenty of other stuff that keeps physicists up at night. 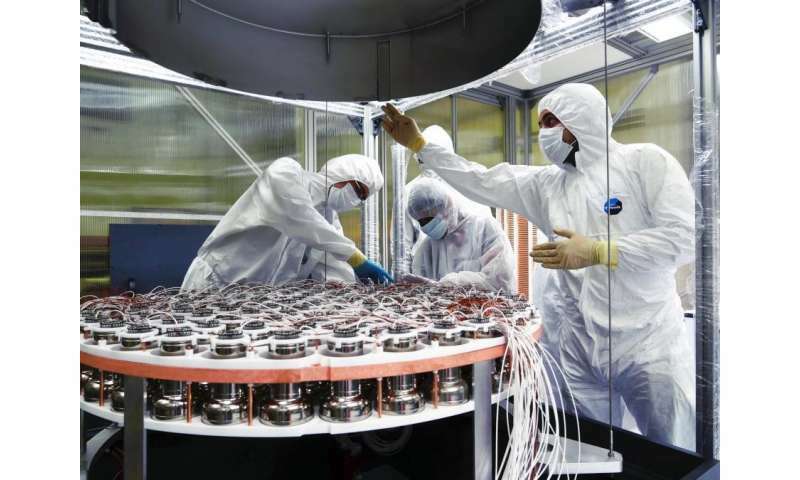 Dark matter research is still in a very early state. When we look back at e.g. the history of electromagnetism research, gravity research or the structure of the atom we see similar patterns: At first there is a slew of theories which get whittled down over time as one by one they get disproven. And this takes time (in the case of the atom more than a millenium). I find it somewhat bizarre that people expect that we jump from "Hey, there's an effect here and we call it dark matter" to a fully proven/demonstrated theory of what it actually is within a matter of a few years/decades. Laymen are watching entirely too many Hollywood movies and think that's how science goes: Theory (which is immediately correct) and then - bam - household gadget based on it 10 minutes later. dark mater is nothing but a Hydrino, a smaller virgin of hydrogen atom, where its electron is in lower level than classical ground state. it does not absorb light nor emit it. They will never find Dark Matter / Energy that way. It is not a physical particle that is "detectable" It emerges from a higher dimension and matter is derived from it. It is what space/time is constructed of and it is the material that causing the expansion of the universe. The between dark matter particles is repulsive in the same way that the force between standard matter is attractive. There is no such thing as a 'hydrino'. It is an invention of a con artist named Randell Mills, who uses it to con money from people with the promise of cheap energy. No serious scientist takes him seriously. He's been promising delivery of this energy for over two decades. It never arrives. It never will. It would have been nice to tell the uninformed exactly which type of known particles are under 4.1X10-47 square centimeters. Errr, that would be difficult. If they were known particles that would imply that we had already detected them. That would have made the front pages. The notion of WIMPs is incorrect. Dark matter is a supersolid that fills 'empty' space and is displaced by visible matter. What is referred to geometrically as curved spacetime physically exists in nature as the state of displacement of the dark matter. The state of displacement of the dark matter is gravity. That no theoretically detectable events have occurred, suggests to me they may be on a wild goose chase. But I look forward to new results and theories being tested. jd, I have a neighbor who fell for that hydrogen power scam. He added the junk 'reactor' to his engine, that the swindlers sold him. Never got it working. For years, he kept fiddling with the devices. Kept buying more junk from the bunco artists. They sell or trade among themselves, their lists of gullible. So when the first effort fails, a new scammer would show up to sell you the 'latest discovery!'. "It'll work this time, we promise." That old truck is still sitting in his driveway. Decaying into rust as the engine is trashed. I guess it's a good thing that he'd never produced any hydrogen fuel? I'm sure it could have been a spectacular fire! And to paraphrase Thomas Edison. "He invented thousands of ways NOT to make a commercially usefull lightbulb." I have to wonder how they could make any statement about size given that nothing was detected at all. If there are dark matter particles and their interactions are simply too weak to detect in the laboratory they could be any size whatsoever. Dark matter is dead, the darkists just don't want to admit it. -and from your performance here to date its clear that youre the kind of person who would make up a story like this in its entirety. More suspect because it appears to demonstrate your superior judgement. While making up stories demonstrates your pathological judgement. https://www.nbcnews.com/mach/science/why-some-scientists-say-physics-has-gone-rails-ncna879346 The XENON WIMPs searches are typical example of wasteful extensive science in decadent EU style. As opposed to talking endless crap on a sci-news comments section. Yep. Keep going Zeph, you might find a recruit one day. "Dark matter" is a "product" of thoughts, of those people whose consciousness is erased, and consciousness is the power of knowing the true causes of the phenomenon, in general. With Xenon to look for something that nothing is known about, it's an unheard of nonsense. It would be the same if in a dark cave, they dug the earth and asked for gold. Is it clear to you all that Einstein seized humanity with his theory of relativity and invented the incomprehensible illogicality that space and time "fell in love and married" as two fagots and without that "love curved net" there would be neither gravity nor even human beings of us. And matter in two states, together with Aether, causes the appearance of gravity and magnetism. Contaminating and stupid stories are: the phenomenon of BB, the spread of the universe, the dark matter and dark energy, the GW, the black hole collapse, and all the nonsense associated with these fatamagers. Science does not yet know: how and from what forms matter, how and why gravity and magnetism arise, what is photon, how matter is formed from subatomic particles to clusters of galaxies, science, does not know the laws of motion of matter, and especially celestial bodies. If this is not known, is there anybody normal who will believe in fabrications without this knowledge.